Wrapping up its 20th year in Eagle County, Vail Jazz Goes to School rolls out its grand finale on the big stage with two performances at the Vilar Performing Arts Center in Beaver Creek. The fourth and final session of the Vail Jazz Goes to School educational features the Vail Jazz Goes to School Sextet performing a selection of tunes that have shaped the history of jazz in America. Vail Jazz Goes to School educator Tony Gulizia (keyboard and vocals) will lead the Sextet through legendary jazz tunes from Duke Ellington & Billy Strayhorn, Benny Goodman, Sonny Rollins, George Gershwin, Dave Brubeck & Paul Desmond, Miles Davis, Thelonius Monk and Dizzy Gillespie. “We also perform a medley of blues compositions authored by the fifth graders as part of the concert. Their lyrics are priceless,” Gulizia says. Drummer Joey Gulizia joins brother Tony on stage, as do Andy Hall (bass), Roger Neumann (woodwinds), Mike Gurciullo (trumpet) and Michael Pujado (congas and percussion). The Sextet presents a dynamic, foot stompin’ show that pulls together all of the concepts taught in the first three classroom sessions, in which Tony and his educating team visited every elementary school in the valley imparting hands-on musical lessons to fourth and fifth grade classes. As part of their education during the previous sessions, students were taught the 12 Bar Blues and during the Vilar concerts, a winning student (or group of students) will be announced for their innovative lyrics and ability to follow the rhythm and rhyming pattern they were taught. Concerts take place at 9:30 a.m. and 1 p.m. on Monday, April 30 and at 9:30 a.m. on Tuesday, May 1. The concerts last approximately one hour and will be attended by local fourth and fifth graders. Tickets are not available online but seats are available at the door to the general public. 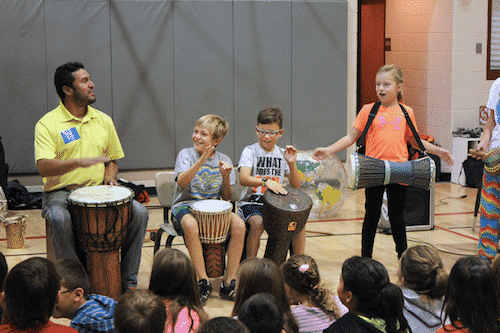 Vail Jazz Goes to School educates more than 1,100 local fourth and fifth graders annually and new in the last year, began visiting a handful of elementary schools on the Front Range. Since its inception 20 years ago, Vail Jazz Goes to School has introduced jazz music to nearly 22,000 school children.